Australian Banks with effect from 1st January 2015 will require investors to provide 30 days notice if they wish to break the term of an existing term deposit. Until now, banks have offered various penalties for the ability to break term deposits, but from next year there will be uniformity in requiring clients to provide notice to break term. The advantage of this is that it will allow the banks to better manage their funding requirements. The chief executive of Curve Securities, Andrew Murray, said banks were making the changes in response to new rules designed to make sure banks have enough liquid assets to survive 30 days of financial turmoil. Under the so-called liquidity coverage ratio (LCR), which is commencing in January, banks must hold enough liquid assets to cover their lending outflows for a month of turmoil. "They need to prove they've got enough funds to withstand a thirty-day run," he said. Mr Murray said the change could be significant for retail investors who needed the flexibility to withdraw term deposit funds at short notice. "In the past they've been able to break their deposits reasonably easily, the banks have been pretty flexible. But now they can't," said Mr Murray, who manages almost $4 billion in deposit products on behalf councils, credit unions and universities. It is understood the change will apply to all term deposits, including those issued before the rules came into effect. The LCR, which the Australian Prudential Regulation Authority will implement from January, will mean banks incur extra costs when managing money that could be withdrawn at short notice. Term deposits will not be the only products affected. Mr Murray said this may also make online saver accounts less attractive to banks, pushing down the bonus levels of interest that are often paid. This is an important change in banking procedures and one that investors should take notice of. Expect depositors to take the hit! Media outlets reported on Thursday that the Federal Government was planning to introduce a deposit insurance levy on Australian Banks. Details of the proposed change have just been released. The levy is to be implemented by the way of fixed fee of 0.05% on deposits up to $250,000. There are a number of possible reactions by the banks to such a levy. Banks will either (i) absorb the fee and deliver a lower profit to shareholders, (ii) source additional revenue through fees and higher mortgage rates, or (iii) reduce the deposit rates paid to investors. Given the oligopolistic nature of the Australian banking industry, we think outcome (iii) is most likely. Indeed, Australian Bankers Association head Steven Munchenberg said that he expects that the banks will pass the levy on to customers in terms of lower interest rates on their deposits. Combined with an anticipated cut in official interest rates from 2.75% to 2.50% at the RBA’s meeting next Tuesday, Australian savers face the prospect of a one-two hit to their income stream in quick succession, after already suffering significant reductions in income streams following a series of successive interest rates cuts since October 2011. The question investors need to answer becomes what should they do in the face of these changes. Sacrifices in income levels and lifestyle are embedded in the lower returns from bank deposits, making alternative sources for yield more compelling. Take for example, the current Australian equity market yield of around 4.3% net. After including the full benefit of franking credits, the gross yield of the Australian share market becomes 5.7% which is more than double the RBA cash rate. Finally - it must be remembered that this is not yet law, and it's outcome depends on the timing of the election, and who wins. We have spoken previously about current cash levels in Australia in term deposits, as a supporting factor share prices going forward. Should investor confidence improve, and investors look to invest some of this, it would be positive for share prices. The chart below highlights the weight of money still sitting in the safety of cash at a time where cash returns are likely to be further depressed by RBA interest rate cuts. Funds in Australian bank term deposits are at record highs of $546bn. With the constant symphony of politicians from all parties clamouring over each other to bash up the banks and accuse the Australian banking industry of profiteering from mortgage holders since the GFC, we examine the truth behind why the interest rates on home loans have risen more than the official Reserve Bank cash rate. First some revision, where do banks source money to enable them to lend out to homeowners? Banks can either attract deposits by offering term deposits and cash accounts or they can "buy" money from the wholesale market, largely from overseas. 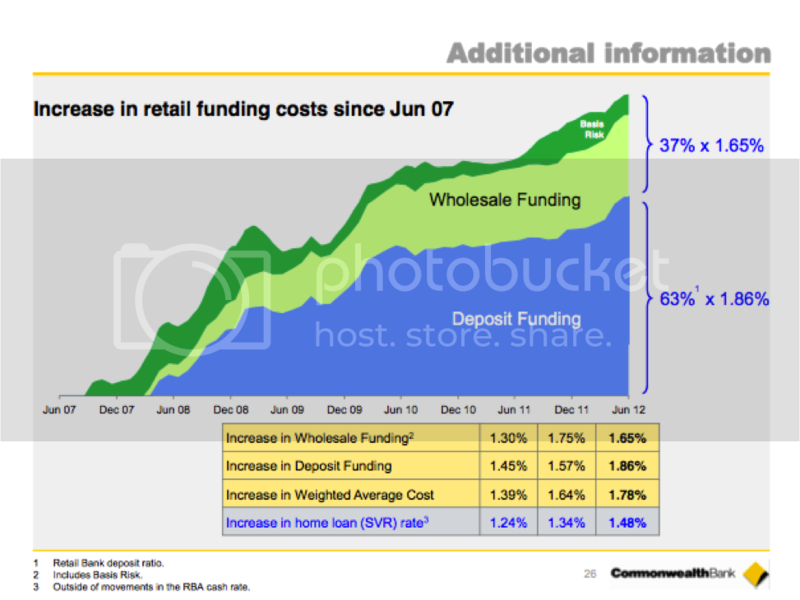 The graph below shows the increase in the cost to acquire these sources of funding since the start of the GFC, courtesy of Commonwealth Bank's analyst pack at their recent results presentation. Despite having to pay on average 1.78% more to acquire funds to lend out, CBA's increase to the standard variable home loan rate has been less than 1.5% which means that the bank has absorbed some of the pain of the increase cost of funding. The bank bashers will not accept this and point to their record profits. The banks higher profitability has come through acquiring several of the second tier lenders such as BankWest (CBA) and St George & RAMS (Westpac) so one would hope their profits are higher as their businesses are now much larger. We readily accept that the cost to build a house has increased due to the increased cost of raw materials such as steel and timber, and yet when the cost of "raw materials" for banks increase we accuse them of gouging. Australia should be proud of our healthy banking system and pay no attention to the ill informed politicians who are bank bashing to distract voters from their own inadequacies. With yields on shares up and yields on bonds down, shares likely offer a decent return premium for long-term investors notwithstanding ongoing short-term uncertainty. However, for those who can’t take a long-term approach, outcome-based approaches or focussing on investment yield are worth considering. While term deposit yields are falling, attractive alternative sources of yield can be found in Australian shares, corporate debt, non-residential property and infrastructure. The investment environment remains tough. On a long-term basis, shares and other related growth assets look attractive after several years of poor performance. Against this, Europe and the US are continuing to suffer aftershocks from the global financial crisis, resulting in periodic falls in investment markets as investors run for safety only to be reversed again as government policy-makers swing into action. Meanwhile popular safe havens such as government bonds and bank term deposits are becoming less attractive as yields fall. So what should investors do? There are essentially three options: sit tight and ride it out; consider outcome-based strategies; or focus on yield-based investments. History shows that over long periods of time, shares provide higher returns than cash or bonds. This can be seen in the following chart, which shows that since 1900 Australian shares have returned nearly 12% per annum (pa) compared to 6% for bonds and 4.8% for cash. In a longer-term context what we are going through right now is not particularly unusual. From late 1969 through much of the 1970s, shares churned roughly sideways (albeit with a 60% slump in share prices along the way). Also, from a high in 1987, accumulated share market returns didn’t reach a new high until 1993. But after each of these episodes, shares resumed generating solid returns. It is also worth noting that over the last thirty years or so government bonds have been in a massive bull market as ten-year bond yields have fallen from around 15% in the early 1980s to record lows in the US now and near record lows in Australia. The Australian ten-year bond yield is now 3.14%, a level which was last seen in May 1941 at the height of World War II. The record low for ten-year bond yields was in September 1897 at 2.9%. This massive decline in yields from the early 1980s was driven by the adjustment from high inflation to low inflation and more recently by worries about global deflation following the global financial crisis. It has generated huge capital growth and hence returns for bond investors. However, with bond yields so low, the days of high returns from government bonds are behind us. Sure, bond yields could fall below 1% if Japanese-style deflation sets in. But it is hard to see the US Federal Reserve Chairman Bernanke or Reserve Bank of Australia (RBA) Governor Stevens allowing this. In the meantime an investor who buys a ten-year bond today and holds it to maturity will get the spectacular return of 1.74% pa in the case of US bonds or 3.14% pa from Australian bonds. The dividend yield on Australian shares today is around 5% (or 6.5% if franking credits are allowed for). Only modest capital growth of 5% pa will generate a total return of 10%, which is well above the prospective return on bonds. So while the secular bear market in shares may have further to go, reflecting public and private debt deleveraging in key advanced countries, extreme monetary policy settings and less business friendly governments, at least a lot is already factored in and given current starting point valuations (higher yields on shares and low yields on bonds) shares should provide a decent return premium over bonds. So on this basis it may be best to stay put with previously agreed strategies focussed on the long term. However, that may be fine for someone who can take a long-term investment horizon, but it may not be so good for those near to retirement or in retirement (like my Mum) and with modest investment balances. Of course it also ignores the opportunities for taking advantage of extreme market moves along the way. So it is worth considering alternatives. Outcome-based investing involves investing in funds that target a particular outcome in terms of return (say inflation plus 5% pa) or income. The key elements of a multi-asset fund managed along these lines would be a focus on overall risk, highly flexible asset allocation capabilities (often referred to as dynamic asset allocation) and wide sources of market returns. This is in contrast with the traditional approach which involves constructing a benchmark mix based on simplistic growth/defensive categorisations and assuming it will deliver to client risk and return expectations. Another approach, which can be seen as a subset of outcome- based investing, is to focus on assets that provide a decent investment yield. This is attractive because assets with a decent and sustainable yield provide a greater certainty of return in an environment of high market volatility and constrained capital growth. However, many of the traditional options here are becoming less attractive. The traditional safe asset – government bonds – has seen yields collapse to record or near record lows. Australian ten-year bond yields have fallen to 3.14% and five-year bond yields (indicative of the yield on an Australian government bond portfolio) are just 2.5%. The average yield on global government bonds is around 1.5%, which is all the more amazing given that Japan and the US, which have the highest weight in global sovereign bond indices, have worse public debt levels than Europe. Bank term deposit rates are now falling with the RBA cutting official interest rates. The collapse in bond yields points to further falls ahead, reflecting a combination of increasing global uncertainty, a moderation in growth in China taking the edge off the mining boom, struggling conditions in non-mining sectors and benign inflation. 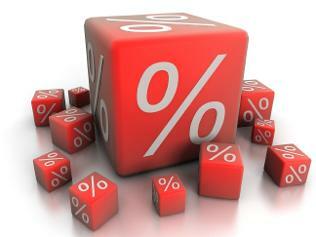 We expect the cash rate to fall to around 3%, which will likely see bank term deposit rates fall to around 4%. Housing used to be seen as an attractive source of investment yield, but after the house price boom of the past twenty years this is no longer the case, with the rental yield on houses around 3.6% and that on apartments around 4.7%. After costs net yields are around 1% for houses and 2.2% for apartments and after a long bull market, Australian house prices are vulnerable to an extended period of poor capital growth. However, there are several alternatives to term deposits, government bonds and residential property in terms of assets that provide decent income. See the next chart. The grossed up dividend yield on Australian shares at around 6.5% is now above term deposit rates meaning that shares are actually providing a higher income flow than bank deposits. Of course, shares come with the risk of capital loss. One way to minimise this is to focus on stocks that provide sustainable above average dividend yields as the higher yield provides greater certainty of return during tough times. Excluding resources, the grossed up dividend yield on Australian shares rises to over 7%, for telecommunication companies and utilities it is around 8% and for bank shares it is above 9%. Furthermore there is evidence that stocks paying high dividends are associated with higher returns over time as retained earnings are often wasted and dividends reflect confidence regarding actual and future earnings. Of course there is no such thing as a free lunch – so the key is to focus on companies that have a track record of delivering reliable earnings and distribution growth over time, where dividends are not reliant on significant leverage and the yield is not high only because there is something wrong with the company. Corporate debt is a good option for those who want higher yields than government bonds and term deposits but don’t want the volatility that goes with the sharemarket. For Australian corporates, investment grade (i.e. top quality companies) yields are now around 6% and lower quality corporate yields are higher. Australian real estate investment trusts (A-REITs) used to be a popular alternative to bank deposits but fell out of favour in the global financial crisis as their yields proved unsustainable partly due to excessive debt. However, A-REITs have now refocussed on their core businesses of managing buildings, collecting rents and passing it on to their investors – all with lower gearing. A-REIT yields, at around 6%, are currently the second highest in the world amongst REITs (after France) and the sector seems to be more stable (falling only slightly during the recent correction). Unlisted commercial property also offers attractive yields, around 7% for a high quality, well diversified mix of buildings, but into the low double digits for smaller lower quality property. Not bad when inflation is around 2%. Finally, listed and unlisted infrastructure offers yields of around 6%, underpinned by investments such as toll roads and utilities where demand is relatively stable. With yields on shares up and yields on bonds down, shares offer a decent return premium for long-term investors despite short-term uncertainty. However, for those who can’t take a long-term approach and/or want to take advantage of short- term opportunities, outcome-based approaches or focussing on income yield beyond bank deposits are worth considering. With investment markets uncertain, many investors have sought the fixed interest markets as a safe haven. While term deposits and cash management trusts can generally be considered safe, particularly with the current Government bank guarantee, this article examines fixed interest investments that are often held in managed funds and allocated pension/superannuation funds that could actually lose money in a rising interest rate environment. The fixed interest funds we are referring to here are usually called “Fixed Interest” or “Capital Stable” funds and form part of the investment menu of managed funds, allocated pension funds and superannuation funds. But how can it be that a fixed interest fund can lose value? The underlying investments of a fixed interest fund typically include long dated Government Bonds. In Australia the Government currently issues 10 year bonds. If an investor purchased a Government Bond and held it until it matured in 10 years time, then the investor would receive their capital back at maturity assuming that the Government was not insolvent. So far, so good. Fixed Interest funds usually (or should) price their investments daily and it is with this point in mind, that investors in these funds can lose value in a rising interest rate environment. To highlight this point, consider an investor who purchased a 10 year bond for $100,000 with an interest rate of 5%. The investor receives $5,000 of interest each year. Should interest rates move up to 10%, the investor would only require $50,000 of capital to generate the same level of income. When fixed interest investments are valued daily, it is this logic that is used to determine the current value of a bond. The principle is simple, fixed interest investments can increase in value when interest rates fall, and can lose value when interest rates rise. Information sourced from Eurostat, International Monetary Fund and Bloomberg show that forecast annual Government Budget deficits around the world for 2010 – 2012 will be around USD $8 trillion (assuming budget balances are converted into US Dollars using the exchange rate on 12th May 2010). The IMF has forecast in its Economic Outlook in April 2010 that these deficits are to be financed by a limited pool of savings. The IMF forecast that the combined global current account surplus positions for 2010 – 2012 are around USD $3.8 trillion. This means that it is forecast that governments around the world will require $8 trillion of funding over the next 3 years, but the savings pool is forecast to be less than half that. This can only result in competition for debt from Governments around the world and the simple forces of supply and demand tells us that this can only lead to increases in interest rates. Linking back to the effect of rising interest rates on fixed interest investments, below is a chart prepared by Magellan Financial Group showing the loss of value of Government Bonds assuming a rise in long term interest rates of 2% and then by 4%. You will see that the value of an Australian 10 Year Government Bond would drop by 24.9% in the event of long interest rates rising by 4% (light blue bar), and would fall in value by 13.6% if long term rates increased by 2% (mid blue bar). The message here is clear, Government debt around the world exceeds available savings and is extremely likely to put upward pressure on long term interest rates. Investors should assess the impact of rising long term interest rates on any fixed interest investments they hold as a matter of urgency. Author of this article is Mark Draper, from GEM Capital Financial Advice. Further investment knowledge is available on the GEM Capital website – www.gemcapital.com.au.